The bus broke down after overheating on a long, desperate afternoon climb from San Pedro de Atacama to Camp 1, leaving about 20 of us stranded for a half-hour against the thin sliver of shade the bus cast. The 2011 Atacama Crossing had its first victim, but after 2 hours, we made it to Camp 1. That morning was competitor check-in: medical review, gear check, food check, bib assignments, etc. My pack weighed in at 21 pounds. I had plenty of food to meet the 2,000 calorie per day requirement. Camp 1 was tucked between beautiful canyon walls. Dinner was a couple empanadas I brought from San Pedro; I wasn't quite ready to break into my freeze-dried meal supply. When the sun set, I realized I probably should have brought one more layer of clothing for the desert night. Camp 1 was the highest point of the race, at about 10,600 feet. It got cold when the sun set. But the cold was nothing compared to the night sky. I’d never seen so many stars. I’d never seen stars so bright. I’ve never seen stars that felt so close. It was the first time during the week when I wished I were an astronomer instead of an ultrarunner. I love the beauty of deserts, and Chile's Atacama Desert surpassed all my expectations. Everyone settled into their tents pretty early. The excitement of the next day made it feel a little like Christmas Eve when I was a kid. I slept two hours. It seems no one in my tent slept much either. It was a cold night, but I'm sure the impending 250-km ahead of us is what kept more than a few awake. Chilean folk musicians played over breakfast (it was still very cold). After a quick course briefing ("It will be hot and rocky and sandy. You will have to run a long way. You will be very tired tonight. "), we lined up for the start. Stage 1 spent the better part of the day above 10,000 ft.
From the very beginning it was clear that my Achilles still wasn’t at full strength, and not really that close either. I took two weeks off completely leading up to Atacama in hopes the rest would be all that I needed. I told myself that I couldn't spend my entire week being frustrated or feeling sorry for myself about months of training basically down the tube. After feeling a bit sorry for myself for about one mile, I came to terms with the fact I had a long, slow week ahead of me. I just wanted to do my best and "enjoy" every step of the way. The Atacama landscape was stunning. Stunning. And have I mentioned that most of Stage 1 was above 10,000 feet? All things considered, Stage 1 by itself was one of the toughest 20+ mile runs I'd ever been on...up until that point. That thought was a little unsettling at camp that night, because the course was only going to get tougher, and I was only going to get more tired. You can be in the best physical shape of your life, but if your mind isn't in it, then you are toast. It was clear after Stage 1 that the most important training that I've done up to that point was the mental. You have to want to finish this race -- and I wanted to bad. 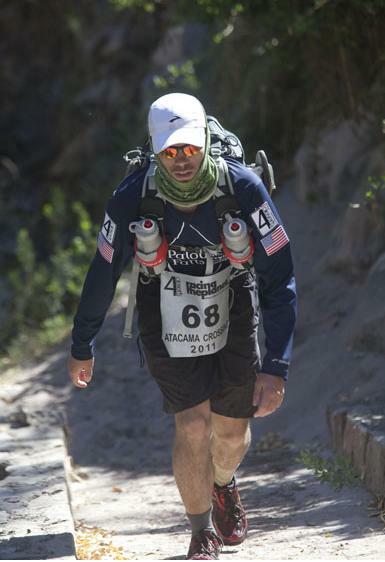 The main motivation for getting to the finish became the desire to eat my dinner, and in turn, lower my pack weight. 21 pounds is no joke. I did most of my training with a 15 pound pack (that was my guess at how much it would weigh before I got all my gear). That extra 6 pounds was very noticeable. Each bite of freeze-dried dinner, each gel and energy bar consumed, even popping a salt tablet, all become a little bit of pack weight reduction euphoria. Camp life consists of finding shade, waiting in line for the computer to read comments from the previous day's blog, drinking water, and chatting with tentmates. The previous day's entertainment was when Chilean police showed up to give the camp a look around. Nothing major, I think they just wanted to make their presence known. I slept better at Camp 2. Might have had something to do with being tired. I left the desert with bruises on my ribs from sleeping on the rocks. We climbed out of the canyon and up an old mountain road. One of the footbridges on the road was built, so we were told, by the Inca. The climb was long and tough, but it was nice using my climbing muscles. Near the top of the climb was an old mining tunnel that we went through. Then more climbing until I reached a ridgeline with the most spectacular views so far. Above the river canyon was a horizon completely filled with a volcano-lined mountain range. A couple of the volcanos were pluming smoke. There was beauty all around. From the ridge we ran down a thousand foot sand dune. At that point I still had some energy in my legs and I was able to enjoy a fast, very fun, floating-like run down the dune. But, of course, the Atacama doesn't really let you get away with anything fun - the sand stayed with me for the rest of the stage, even after dumping it out of my shoes a few times. There are special sand-catching parts of my shoes that I wasn't aware of before. After a few kilometers through sand, the last 15 or so miles were a long, long trudge under a sun that doesn't blink, and wind that never inhaled. It was sections like these that made this race as mentally challenging as it was. But I made it through another stage alive and ready for another day. "If my feet had hands, they'd strangle me." This seemed to be the only thought I had flowing through my mind during Stage 3. The course threw the most brutal terrain at us so far: sharp and piercing sun; more sun; sharp and brittle salt flats; sharp and brittlier chunks of exposed shale that were so brutal that I believed each next step was going to rip apart my shoes; and (near) never-ending sand dunes that made me want to return to walk across the shale. Though volcanoes looked over us all day, I spent most of my time watching the ground about two feet in front of me. I walked every step, a decision I made before the stage started. Crossing the finish line in San Pedro on Saturday was the ultimate goal - the clock and my placing barely registered on my radar (though the faster I finished each day meant the more time I got to rest in the tent). With each stage, though I was miles closer to the finish, each step became twice as difficult as the previous step. 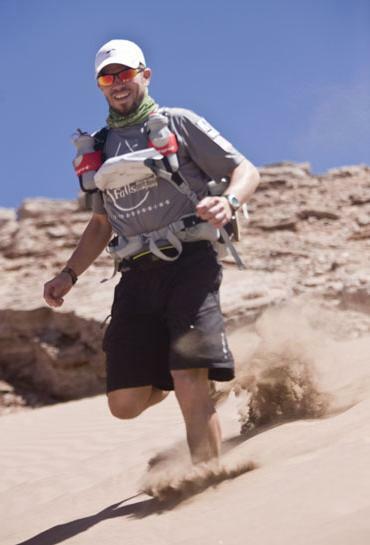 The miles were adding up quickly, and the Atacama conditions were simply piling difficult on top of difficult. At this point I had finished half the stages and approximately half the distance. But the next two days were promising to be the toughest yet. We received a course description each morning, and each checkpoint is broken down with terrain descriptions like "moderate" and "difficult" -- the next two stages (including the epic 46 mile stage that everyone around camp is seemingly afraid to even talk about) are given "extremely difficult" labels on several of the sections. No section of the course had been given this label yet. This was the day when it started to feel like, "Wow, I barely finished today's stage. How can I possibly finish an extremely difficult stage tomorrow?" These were the moments when I had to remind myself why I was doing this in the first place. "Can I do this?" That's what I was there to find out. I believed I would. I think you need to believe you can finish; that's the only way to find the strength in the bottom of your gut to take one more step. If you don't think you can do it, then there's no reason to take another step. But what makes an event like this so difficult is that no matter how much you believe you can finish, somehow doubt creeps in. The course and weather and blistered feet pound you from every direction, and each bit of pain or adversity lets a little sliver more of doubt creep in. And the sleep deprivation. There's a point when you are worn out and can sleep through just about anything. Then there's the point past that were you are so sore that getting comfortable while laying on rock is impossible. I slept only 3 hours the night before. That made for about 11 hours since Friday night. I sat under the setting sun at camp and imagined that I would cry if I made it to the finish line. 111 racers started on Sunday. 15 didn't make it past Stage 2, and a few more didn't make it past Stage 3. I saw tough and able endurance athletes packing up their things to go home. Many of them have completed other deserts. Most of them say that the Atacama has been the harshest one yet. I told myself before sleep took hold, "I will stay strong." Every painful step, each piercing pain, all the throbbing bones of my body -- reminders that I'm alive. Reminders of why I'm doing this. Reminders of the beauty I'm finding within myself. The salt flat section was like a 9-mile field of corral. On tired legs it was easily the most brutal terrain I've ever attempted to cross. Each step needed to be accurately calculated. And even then I was unsure whether my weight would crush the cruddy salt formations and sink me ankle deep, or whether the jagged edges would stay firm and simply pierce against my already flat tires (it did both - often). Each step took so much attention and concentration that at one point I started to get light-headed. I realized that I had forgotten to take my electrolyte tabs and a GU for nearly two hours. And I wasn't drinking as much water as I should have been. It was a bonk that hit me as fast and as hard as one had ever hit me. I took a few minutes to refuel before I continued on. My head and body felt much better, but there was no relief for my feet. The stage started with more sand dunes, and then there was more rock. And then more sand. I got my first blister, but it wasn't bad -- and hardly worthy of being called a blister in the Atacama. Many others had feet covered with all imaginable blisters, and it cost a lot of them the race. The first of our tent dropped out near the end of Stage 3 because of painful blisters that made it impossible to carry on. (Another tent-mate finished the race with 19 blisters on his feet.) Around camp it was becoming a humorous sight to watch everyone attempt to walk from their tent to the water or the port-a-toilet; everyone's feet were so damaged that it looked like a layer of broken glass had been spread around the campsite. Stage 4 was, in my opinion, the hardest mile-by-mile stage of the event. Of course, it had a lot to do with the previous 3 stages wearing on me, but it was also the most brutal terrain and, it seemed, the hottest day of the week. There was a bit of drama as one of my tent-mates, Brad, hadn't reached the camp when there were less than 30 minutes to the cut-off time. 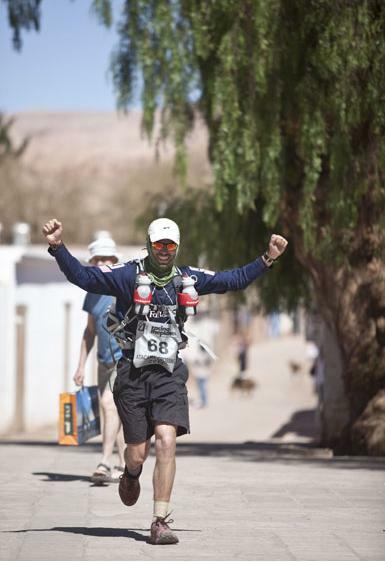 It was a brutal stage that got the best of a few more racers, but Brad came jogging into camp with plenty of time to spare and in very good spirits. In fact, everyone around camp was in very good spirits after Stage 4 - it was a stage worth being proud to have finished. But there was definitely an unease about the upcoming Stage 5. My legs were so sore that I wasn't quite sure how I was going to manage the long stage. But my heart was in it, and I believed that I would finish. Stage 5 is nearly 46 miles long, and we basically had two days to complete it. For those who didn't want to run through the middle of the night, there was an overnight camp. Many utilized it. My plan was to see how I was feeling when I reached the overnight camp. If I was feeling poorly, then I planned to stick it out at the overnight camp (some 13 miles from the finish as main camp). I figured there was no sense in hurting myself or pushing myself too far during the night. The goal was to finish in San Pedro, not to risk anything unnecessarily on the long stage. Finding the right words to describe what happened on the Long March might be tougher than the race itself. It was one of those moments that you know will be an intimate part of your memory for the rest of your life. I reached my lowest low on the Long March. And just as I was at my lowest came one of the most incredible things I've experienced as a runner. I was 50k into the day and only 5k from checkpoint 5, which was the overnight camp, and I could barely take a step. It took me maybe 1.5-2 hours to go 5 kilometers. I was hurting bad, my mental state was as fragile as it had been all week, and I couldn't stomach any food. A dozen racers passed me and wished me good luck; they see how bad I was hurting. I hobbled into the checkpoint around 7:15pm and dropped into one of the two tents. I wanted to go to sleep and end the day. I ate a couple gels and took my shoes off. I was feeling around 80% sure that I was going to stay there for the night. All I needed to do was get some rest, and then I would have all morning to finish the last bit. I was in no hurry to keep moving. The moment I decide to "just run"
I'm not sure exactly when it was that I made the decision to keep going, but I put on my socks and my shoes and I tossed my pack on my shoulders. Headlamp on, I started toward the next checkpoint, a bit scared that I wouldn't be able to make it 10km to the next checkpoint, imagining scenarios where other runners come upon me and have to go find someone to come get me. But as I walked from the tent and into the darkness it was very clear to me that this was the reason why I made the trip to the Atacama Desert, that I had stumbled upon a moment that not many people will ever have a chance to experience -- I was there to test myself when I'm most vulnerable. And I was vulnerable and willing to take a leap. It was 8pm and the sun was setting over the mountains and I had 13 miles before I reached camp. Temps dropped about 40 degrees and a tailwind picked up. I was shuffling for the first two hundred yards from the checkpoint, and then a calmness overtook me and I told myself, simply, "Run. Just run." So I started running on legs that can barely keep me standing. The stars came out, and I won't ever be able to describe their beauty that night. The sky was so bright I didn't need to turn on my headlamp. I felt that I was taking energy from the stars and that the stars were filling my body and pulsating through my legs. I had never felt anything like it before. My body was a part of the universe. I felt no pain or ache, and I ran all the way to the finish line. I was so happy to be alive. Those who finished the Long March the night before were rewarded with a full day of rest. Runners were still coming in just before the noon cut-off time, some injured and most very emotional. I spent most of the day soaking in what happened when the sun went down the night before. I wished others could have seen the stars. I thought I had seen the stars before - I mean really seen them - but the sky there just blew away anything else. It was like looking at school children's finger paintings all your life and you think you've seen paintings, and then some random day you walk unsuspectingly into the Sistine Chapel. The talk around camp was what our first meal would be back in civilization. Pizza? Chacarero (steak and green bean sandwich)? Pizza? GUs and Clif Bars and freeze-dried meals are not the most popular source of calories anymore. My tent-mates were a great group - 2 Danes, 2 Chileans (a third withdrew because of blisters), 2 Aussies, and a Lebanese. I could write another long story about the camaraderie that takes place at an event like this - it's pretty amazing. My legs appreciated the extra hours off. The final stage jog to the finish line in San Pedro seemed, at times, like a mirage on the desert's horizon. Were we really so close that we could see the finish line? Was it really there? I've completed the Atacama Crossing. There were tears in my eyes as I crossed the finish line, then again shortly after when I found a spot in the shade as everything sunk in. Everyone had an extra bounce to their step, and many people brushed off all the pain and bruises to run the entire stage into San Pedro. It was an incredible feeling to cross that finish line. It was a gorgeous desert. It was a brutal desert. Thanks so much for all the amazing support. Beautifully expressed. Well done buddy and thanks for the pics. Thanks, Sumanth. You were an inspiration. You are a legend my friend! What an amazing adventure you had! Wow! What a great read and what an incredible achievement. You did it! Awesome. Excellent report. My feet are sore from just reading it. Ultra running...what a great sport! Stage1 – After only 2 hrs sleep. The only thing going for you this day is the pure high of being there. Stage2 – The sand dune looks amazing but I imagine the grains of sand ended up feeling like mini shards of glass by the end of the day. Stage3 – At this point being so sleep deprived would have had me in a fetal position crying like a baby. You are amazing! Stage4 – the pic of your shoe on the salt flats looks painful! I cannot imagine the feeling that was radiating through your body. 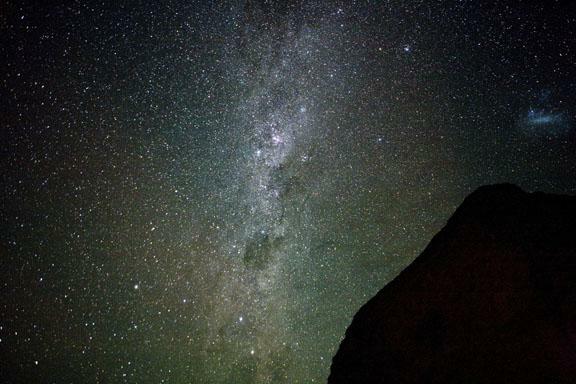 Stage5 – taking energy from the stars….simply amazing. I am speechless! Finish line – Your smile is as big as the I have ever seen. You are a changed person in more ways than you know. Congratulations! What an epic journey. Your description is so well done, and I hope to someday see the stars the way they were meant to be seen and the way you saw them. Wow. Congrats Scott. What an amazing accomplishment. Your recap was really powerful. Thanks for sharing, and that finish line picture is classic! i've read this 4 times now. such an amazing accomplishment and it really leaves me speechless. which if you knew me, that doesn't happen often. by far the best race report i've ever read. i bet sadie was so happy to see you!! WOW!! Great race report and photos. I loved it when you put on your pack at the stage 5 overnight and kept going. That's what it's all about! An adventure of a lifetime. Congratulations Scott on your acomplishment!! Man, what an accomplishment. Speechless actually - Thanks for sharing your story. What an amazing accomplishment, adventure, and exploration of the desert and the mind. Incredible! Very inspiring. Thanks for sharing your accomplishment. May you recover quickly and happily! Thank you so much for sharing this incredible journey! Congratulations doesn't do you justice. You are a true man and experienced the universe 1st hand. Fantastic is all I can say! You are more than an inspiration. Well done Scott! Me and Tess are truly amazed by your achievements! Maximum respect from the UK crew! Congratulations, Scott! What you did is so amazing! Aweseome! (I know it is over used, but it fits). What a great adventure. Stage 5 was the best! Welcome home. We read the race report as a family and are all so impressed. Inspiring. Very much looking forward to closely going through your Facebook photos. Your words say it all - you obviously had the heart and the mind to make it through the week! All the best to you, and keep in touch! crying as i read your report. so damn happy for you. Scott, you DID IT - you finished!!! I am sitting here in total awe for you, congratulation on finishing a race where very few will ever get to the start line, let alone finish line. I am super stoked, and very VERY happy, for you!! Congratulations!!!! Off to go check out your FB pics (took me awhile to figure out that we're already "friends" - I am horrible with bloggers last names :)). - What DID you get to eat when you got to that free day? Did your stomch protest the intake of real food when you were able to? - How long until your feel felt like walking? I ran alone for probably 80-90% of the 155 miles. Most of the time I could see others in the distance or behind me. Though the canyons and mountains it was a bit more "alone" time than on the desert flats. The course was marked clearly with pink surveyor flags; it was very hard to get lost. Surprisingly (to me, at least) my feet and legs felt just fine to walk the next day. It was about a week before I went on a run, but walking was just fine. Especially when I was walking to lunch and dinner in Santiago. I realize you ran this a year ago, but I wanted to say that I really enjoyed reading your review. It's clear you are very mentally tough! That's an area that I'm working on as we speak. Reading this made ​​me remember all the moments - good or hard - I've lived in this edition 2011. This proves the quality of this report excellent. You have been a very good neighbor in the tent 8.